Home / Adventures / Mexico / To see with your own eyes is to believe..
To see with your own eyes is to believe..
For sometime now I kept having the same dream over and over again. The dream would begin with me arriving in Mexico for a month on vacation, funny thing is I never actually left the house. The dream would always end with me wanting to go out the house and revisit the store I used to walk to or the market around the corner, but whenever the door got opened and I stepped outside it twisted around and there I was on a plane and on my way home..
3 comments on "To see with your own eyes is to believe.."
Oh my! now you made me hungry! 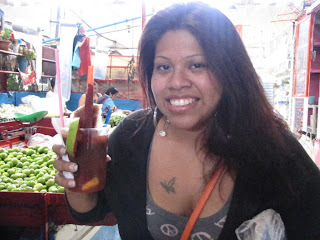 I want some carnitas and taquitos and fruta con chile...Nice post! thank you for "taking" me along with you-- beautiful country, beautiful you!